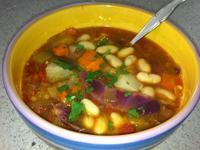 it must include white beans, cannellini (or Northern White)to make it authentic. Cannellini are delicate beans with a creamy texture. A portion of them are ground into a paste with their liquid and stirred into the broth and the remainder are gently rinsed and added to the soup. So, put on your favorite Pavarotti Disc (optional) and. 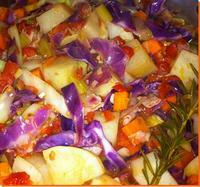 . .
Three more vegetables of your choice, 1 Cup each. We used potatoes, zucchini and trimmed green beans. Divide the Cannellini in half and mash (or process) half; stir into Stock/Broth until smooth. Take a minute to appreciate your preparation! The colors are so beautiful and the shapes varied. What a visual feast! In your soup pan over medium - medium/high heat, add 2 Tbp of olive oil to coat the bottom of the pan. 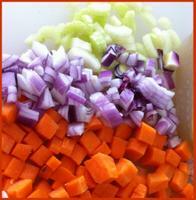 Sautee the mirepoix (carrots, celery, onion) for 3-5 minutes until they just begin to soften. Add the zucchini, potatoes and cabbage and continue to cook for another 2 minutes, add the tomatoes, stirring gently until the tomatoes begin to break down. Stir in the Broth/Stock and turn heat down to a medium simmer. Gently add green beans and cannellini beans, rosemary, oregano, salt and pepper. Taste. Add more seasoning if needed. Simmer gently another 10-15 minutes. Like all great Italian food, this tastes absolutely wonderful on Day One, and the leftovers taste even better on Day Two, so try to make extra! Serve with a good quality crusty bread and Buon Appetito!